The crucial difference between the hub and bridge is that the hub works on the physical layer, but the bridge operates on the data link layer of the OSI model. Both hub and bridge serve the different purpose. A hub transmits the data to each device connected to it, it broadcasts the data. On the other hand, a bridge is more intelligent which checks and filter data before forwarding it, this mechanism significantly reduce the network traffic and improve security. Hub connects two LAN segments whereas the bridge can connect two different LANs. Basics Used to connect a number of devices. Facilitates in the segmentation of the larger network. Types Active and Passive Transparent, translational and source route. Links Segments of LAN Two different LAN employing same protocol. Hub is an elementary networking device, as it provides very simple functionality of establishing a connection between the several devices. Additionally, the device serves as the connector of the different LAN segments. The devices are connected to the hub with the help of twisted pair cables. The chief purpose of the hub is to transfer the data packets to each device connecting it. It does not perform any filtration which means that each chunk of data is transmitted to all the connected end devices even if it is not destined device. That is the reason it is said to be an unintelligent device. The hub works in the single collision domain which means that the transmission lines should be operated in the same speed. The bridge is also a networking device which connects two different LAN operating on the same protocol. Furthermore, it is used for fragmenting the larger LAN into smaller networks. When a bridge receives a frame from the network it retrieves the destination address from its header and checks it in a table to find the location where to send the frame. Unlike a hub, in the bridge different lines can have their own distinct collision domain. Ethernet cannot deal with the token ring frames the reason behind this is the inability to find and retrieve the destination address in the frame header. Though, a bridge can utilize line cards for different network types and variable speed. It is mentioned that a bridge can also partition larger networks into smaller networks, but how does it do it? The bridge is placed between two physical network segments and it monitors the flow of data between the two segments. Here the MAC address plays an important role in deciding whether the data should be forwarded or discarded based on the condition. Earlier bridges employ the manual creation of the MAC address list while in modern bridges this task is done automatically by watching the traffic on the network, these bridges are known as learning bridges. 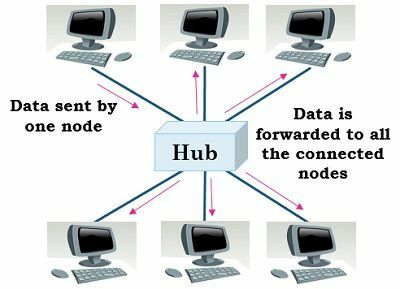 A hub is used as a central device for providing the connection among the various nodes. On the contrary, the bridge serves the purpose of filtering and forwarding of the data in the network. Hubs are of two types – active and passive. As against, transparent, translational and source route are the three types of bridges. 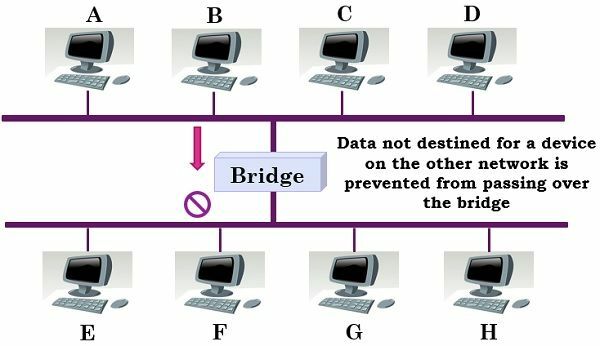 Data filtration is carried out in the bridge while it is not performed in the hub. Hub uses multiple ports while the bridge employs a single incoming and outgoing port for the specific data. There are basically two types of a hub, active hub and passive hub. Passive hub – The passive hub just provides a passage for the transmission of the electrical signals. Active hub – In the active hub, instead just providing passage for electrical signals it also regenerates the signals before transmitting it to the other connected devices. However, it does not process any data. Transparent bridge – This type of bridge are hidden to other devices on the network, other devices are unaware of the existence of these bridges. A transparent bridge mainly blocks and forward the data based on the MAC address. Source route bridge – The source route bridge is utilized by token ring network. These bridges contain frames along with route information, which helps in making decisions for the frame forwarding through the network. Translational bridge – These types of bridges can convert the network system type, which enables the linking of two different networks, for example, Ethernet and token ring network. The translational bridge can alter the information and fields from the frame, ultimately translates the data it receives. The networking devices hub and bridge are intended to do different functions where the hub is used as a connector of the LAN segments. On the other hand, the bridge is used for connecting two different LANs.